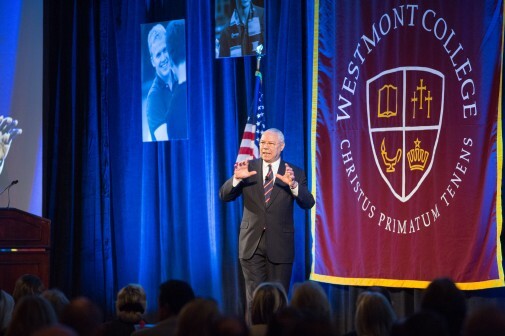 Retired Gen. Colin Powell used a combination of poignant stories and humorous anecdotes to keep more than 750 people wide awake during the 7 a.m. Westmont President’s Breakfast March 1 at Fess Parker’s Doubletree Resort. 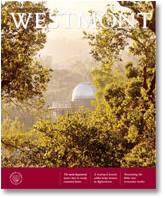 He dramatically wove stories about camels, squirrels and hot dog vendors around reflections of soldiers at war, lessons of leadership learned from President Ronald Reagan and tales of America’s resiliency. 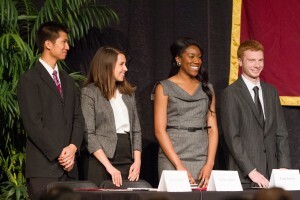 Powell also spoke in convocation on campus, answering questions from a panel of four students: Daniel Gee ’13, philosophy and music major; Natasha Dass ’13, biology and anthropology major; Leah Smith ’13, economics and business major; and David Dry ’12, political science major (left to right, above). Religious studies professor Charles Farhadian (above right) moderated the discussion. The students began by asking why they should care about the decisions that come out of Washington. 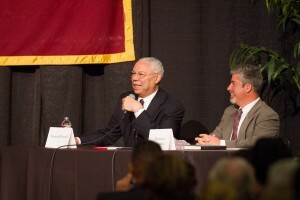 Reminding them that our government is “of the people,” Powell said, “You will decide who’s going to be governing us. It’s much more difficult to do that now in the cacophony of noise we hear from television and radio and the Internet. But it places a greater burden on you to be informed citizens… [which] doesn’t mean just listening to your favorite guy on television or radio, but to question it. Does it make sense? Is he right? Noting that Powell went to Vietnam during the civil rights era, the students asked, “What were your thoughts as an African-American man on serving the nation during a time of national racial tension?” “I was an African-American soldier, but I was a professional soldier,” he said. “African-Americans, even in the worst circumstances, stepped up to defend the country when called upon. Before the Revolutionary War, black men served in the militias of America. In the Revolutionary War, one-sixth of George Washington’s army was African-Americans—same thing in the War of 1812 and the Civil War. After the Civil War, black men stayed on as buffalo soldiers. Powell grew up in New York City in an immigrant family. “Do you think that a great American success story like yours is still possible for American children growing up in present times?” the students asked. “Of course it is,” he said. “Nothing changes. There’s an American success story every single day in this country, a thousand of them. American success is young people who are willing to go after it. 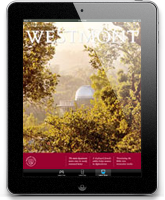 Young people who have prepared themselves through a quality education. Young people who have a dream and believe and work hard and believe in America.